Do you work in a dental practice and wish that fitting implants were an easier procedure? Enter our challenge for a chance to win our new implantology motor worth 2990 EUR during the EAO congress 2018! Go around the exhibition hall and look for the 6 NEW Chiropros which have been numbered and placed around the room on the booths of our various partners. 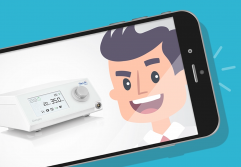 When you find a NEW Chiropro, take a selfie with it, making sure that the number of the NEW Chiropro is clearly visible in your photo. The participant who posts the most selfies featuring our NEW Chiropro will win our new implantology motor. In case of a draw (if more than one participant has posted the same number of selfies), the name of one of these participants will be drawn at random to decide the winner. The name of the lucky winner will be published on our Facebook page on Friday 30 November 2018.